Also, our very own Sonic Eutanizer, aka Shannon Drowne, will have some artwork on display at Essential Indulgences (massage therapy) on 2nd Street from 5pm - 7pm. Check it out! One way I try to improve my physical condition for roller derby (and generally maintain a healthy lifestyle) is by running. I haven't always been interested in running, and only recently have I been able to run even a mile without stopping to walk. I'm writing about running because I am in the middle a three 5K-race-palooza that somehow I got myself into. Thursday, May 20 I ran in the CDPHP Workforce Team Challenge with my coworkers. This was actually a 5K+ race - 3.5 miles total. My time for that race was 40 minutes and 2 seconds. Not too great, but pretty much on pace with what I expecting to run. 11:47 min/mile; about 5mph. I headed right to practice after this race and skated my tail off for two hours -- I felt awesome! Must've been a post race high. Of course, as soon as I got home I slept like a baby. On Sunday May 23, I ran the inaugural SPAC 5K Rock & Run with my friends Jen, Brendan, and Susan. My friend Jen has a good recap of this race. (By the way, her whole blog is awesome, especially if you like health food and running.) I'm happy to report that I beat my personal 5K record that morning, crossing the finish line at exactly 33 minutes (previous record: 35:34 - Turkey Troy, November 2009 - my first 5K!). My average mile was 10 min 38 seconds. Nice! I came in 567th out of 776 runners. How fast do you need to skate in order to complete 25 laps in five minutes? 236.5 feet on the outside. For my calculations, I took the average of these numbers: 192.5 feet. The number of feet in a mile is 5,280. The number of laps in one mile is (5,280 ft /192.5 ft) = 27.4 laps. 25 laps is equal to 0.91 miles (25 laps /27.4 laps). Therefore, the skater must travel 0.91 miles in 5 minutes. We all know that velocity is distance divided by time. 5 minutes is equal to 0.083 hours (5 minutes / 60 minutes). Therefore, a skater must travel 0.91 miles in 0.083 hours. 0.91 miles / 0.083 hours = 10.9 miles per hour. ∴ In order to skate 25 laps in 5 minutes, a skater must travel at an average velocity of 10.9 miles per hour. **Please note these are just quick and dirty calculations. If any other super nerds want to add to or continue this conversation, leave a comment! Last week we held skills testing for the majority of our freshmeat. The test is pass/fail and based on the WFTDA Minimum Skate Requirements. What's that you say? Not everyone loves that drill? Ok, just me I guess! It's not easy (at first), but you gotta do it. And then when you pass skills testing and get to skate with the vets, you get to do it all the time. Awesome! 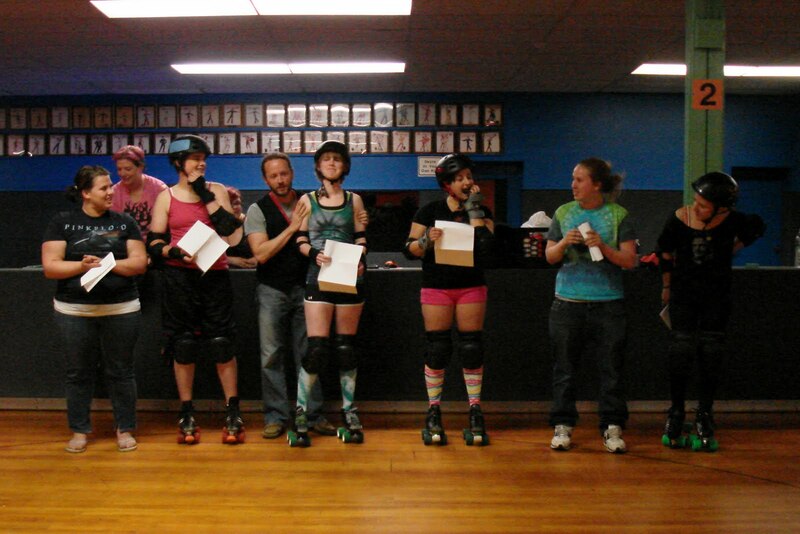 On Monday night Coach Beefcake announced the six girls who passed Minimums. Of course we got them right into the pack with us doing drills. They did great! A couple have some super speed and all of them can take a hit. We are proud of you Hellions! Can't wait to watch you grow into even stronger skaters and players! Does this sound like something you want to do? Send an email to hellionsrecruitment |at| gmail |dot| com and tell us you're ready for whatever we dish out. Or tell us you're scared as heck but would love to give it a try. It's all good! Saturday night in Rochester Kitty took us out to a goth club (!!) called Vertex. Not my normal scene, but I figured, "when in Rochester." It ended up being a super good time though! Kitty taught us how to dance, with classic moves such "the marionette", "dead arms", and the classic "punch and stomp." While looking through pictures on my phone from the weekend, I found one that I took in the bathroom (haha) of some graffiti. Very derby appropriate, I think. Earlier last week I didn't have any plans for the weekend. In fact, I thought it might be nice to spend it at home and relax. Then I got an invite from Pink E. Racer from the Utica Rollergirls to join them in Rochester for a scrimmage on Sunday morning against one of Roc City's new home teams. ALRIGHT!! Kitty and Reading Rambo also decided to join us. Fast forward to Saturday evening: Rambo and I are rolling down I-90 to meet Kitty who already happened to be in Rochester. We figured driving out Saturday evening would be better than leaving Albany at 7am for the 11am scrimmage. We're crazy, but not that crazy. Sunday morning, Kitty took us to breakfast at Tim Horton's. w00t! Then we made our way to Roc City's facility - the arena where they skate is really nice! It was my first time skating on Skate Court - I approve. Rochester's team was very new. It's my understanding that of the 15 or so girls there that morning, only four had bouted before. 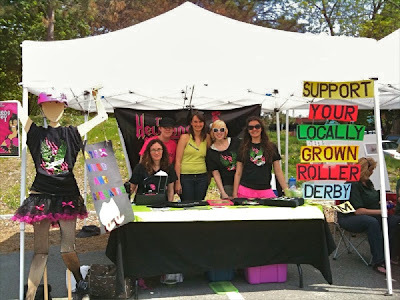 Their first bout is coming up on June 12, so they were hoping for some outside teams to help them prepare. Needless to say, we were dominating them. BUT, I personally feel they have a lot of potential and they also did a GREAT job adapting to some of our strategies. For example, I am short and I will take advantage of that when necessary. Roc City had 2 or 3 girls who were probably 7 feet tall with their skates on, I am not kidding. And one was named GWAR. I was shaking! So anyway, I decided to skate low to the ground, which made me a more difficult target. That strategy worked out for me for awhile, until a few of the girls figured out they could also get down low, which made me much easier to hit. Nice adapting! Another awesome part of of this trip was that my friend Liz, who lives in Rochester, came out Sunday morning to watch us scrimmage. Liz is my first college friend to see me play! 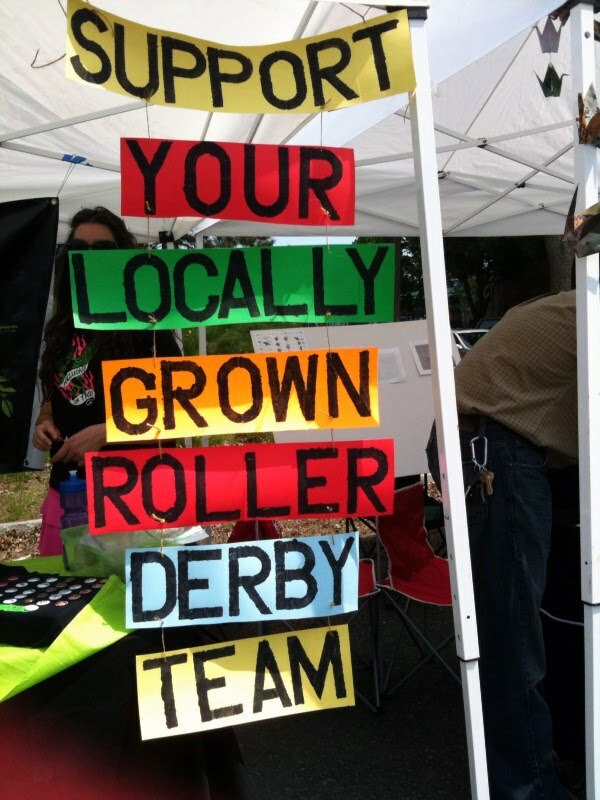 Being involved with roller derby always offers you the opportunity to be doing the last thing you thought you would. Luckily, it's usually awesome things like this! 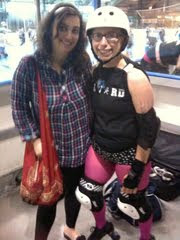 Thank you to Roc City Roller Derby for hosting us on Sunday morning and for providing lunch. It was nice meeting you all - good luck with your game on June 12! 1. It's okay to be nervous before hand; just allow those butterflies to clear as you are skating your team introduction laps. At the beginning of the bout, each team is introduced to the crowd. There was something really, really awesome about skating in a big pack with my whole team. When my name was introduced, I wish I could have done something awesome, like a flip or a barrel roll, but I just threw my hands in the air. It was such an exciting moment. 2. Don't expect to be put in for the first jam. Or second. Or third, fourth, or fifth (if it's your first bout). Not that I expected to be played a lot - this just confirmed my suspicion that veterans would be put in ahead of me. 3. Don't expect to be put in more than a couple jams (if it's your first bout). When our team scrimmages each other at practice, we may only have 5 - 7 players per team. That means a skater gets put in every other jam at least. Not too many breaks! After an hour, I'm usually exhausted! For the bout, our rotation was split between 14 girls. That way, almost everyone got to take a (short) break after almost every jam, and probably for a few jams in a row. Glad we work our butts off at practice - it makes this aspect of bouting that much easier. 4. If you survive your first jam ever, you'll survive the rest of them. 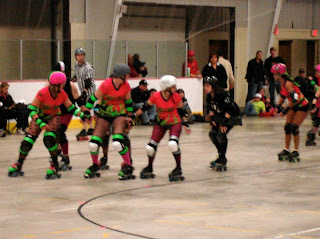 I was picked to go in as a blocker about 10 minutes into the bout. I knew as a new player, my main priority was to guard the inside line. I felt nervous, but I felt very focused. I had my teammates out on the track. I was also surrounded by girls from the other team who I had no idea what sort of skills they had. Were they all going to go after me because they knew it was my first bout? Answer: not really. This game isn't about killing the newbie blocker. The Utica Roller Girls were super focused on defense and were all over our jammers. Sure, they'd strategically attempt to take me out with a hit once in a while. But once I realized I was "safe", I felt that I could better focus on my tasks - guard the line and watch out for the jammers (of course, I was still going to watch my own back). 5. Not everyone hits like a truck. I thought that I'd be spending the majority on my time on the ground. One of the things I was surprised the most about is that when some of the girls would hit me, I didn't fall to the floor and I didn't lose my balance! That made me feel so confident! 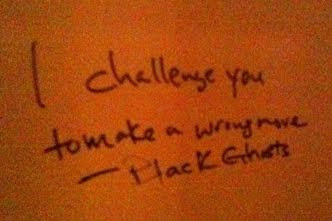 I'm not saying that URG was throwing weak hits, but maybe I'm not as weak as I thought I was. 6. Show them what you're worth. My primary goal for my first bout was to survive it without making too many mistakes. I knew my job was to guard the line, watch for the jammers, and always put myself in a position where I was being useful to my team. Any extraordinary plays or hits were not specifically on my agenda. But then, during one of the last games, I managed to avoid a hit from a player I knew could knock me into the solar system if she wanted to. Not only did I avoid her hit, she ended up on the floor and I ended up jumping over her. It all happened so fast, I wish I could remember exactly what I did to make this happen. Did I hit her? Either way, she went down and I stayed up. I heard her shout, "what the ****!?" And believe me, I was just as surprised and was thinking the exact same thing, haha. Talk about extraordinary! I'm working on a recap of the bout from this weekend. If you're itching to hear the details sooner than later, stop by Badass Burrito tonight in Troy. The Hellions will be guest bartending and regaling tales of our bout against the Utica Roller Girls. I will say that I had a GREAT time on Saturday. My first bouting experience was everything I hoped for. More to come! ng drill which focused on both giving hits and taking hits. At the end of the drill, I felt discontent with my performance, and I think this was clear to coaching due to the sour look on my face. (One of the reasons I was not rostered for the first bout was because my hitting skills were not up to par.) "You want more practice hitting, Short T?" asked Beefcake, our coach. "Ok. EVERYONE! Line up, two even parallel lines. Short T in the back. This drill is called The Gautlent." My teammates lined up side by side. My objective was to make my way through the middle of the two lines, with the two players next to each other in line pairing up. The goal was to execute a reasonably powerful hit on one player or the other. If I tried to hit one player, but missed, I could work on her partner. Once I performed a satisfactory hit, I could move up to the next pair. My little graphic on the left probably makes it looks too easy. Imagine me actually bouncing off of girls maybe 5 or 6 times at least before moving to the next XO pair. So maybe it looked something more like this one on the right. I got through, but it wasn't pretty and it wasn't easy. But it did show that my teammates were happy to help me become a better skater, and it ended up being one of my most memorable practices. Since my first bout is a few days away, I wanted to look back at my time as a new skater. For the first three months with the Hellions, you are considered "fresh meat". New recruits will often show up with a derby name in mind (more than once, I've heard people say the name they want is Punky Bruiser.) 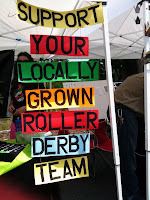 However, you need to earn your derby name! That's why it's Hellion tradition to give our freshies an endearing nickname in the meanwhile... with the requirement that it has to do with "meat" (vegetarians need not worry, we'll call you something like Tofutti or Chik'N instead!). My fresh meat name: Turducken! I thought this was the dandiest nickname. But of course, nothing is perfect and Flexi Wheeler threw her head back in laughter when she found out my name. "Turducken, huh? Welll, sorry to say, but I am going to have to call you TURD!" I should've seen that one coming. So here I am, back in September 2009. As I said in my first post, I didn't have much skating experience before joining roller derby (so don't try using that as an excuse when someone tries to recruit you!) Back in September, we did not have the excellent fresh meat training program we have today, but I was taught my skills none-the-less. Fellow class recruits include Asa Diamonds and Ref Foxworthy. Bear Lee Giveash*t was still pretty new at that time, too. So while the big kids (aka, the vets) worked on pack drills, we were taught the basics of skating, falling (without hurting ourselves), and stopping. The veterans that worked with us rotated, but I can say that I learned how to T-stop (a stop in which you put one foot behind the other, perpendicularly, dragging it on the floor) from Flexi Wheeler and how to execute a "baseball slide" fall (pretty much what it sounds like) from Dr. Bi O'Hazard. Weeks passed and coaching began to integrate me in with the experienced players. For some reason, when I bought the rest of my gear, I forgot to buy a mouthguard. Of course when the refs saw that that I was skating without one, I was forbidden to participate in any contact (hitting drills) until I rectified the situation. This may or may not have had an influence in how long I ended up waiting to buy a mouth guard... but my fear of getting hit was something I had to get over. Plus, I was told that for the first few times, people would take it easy on me. I remember the first time someone didn't take it easy on me, though. 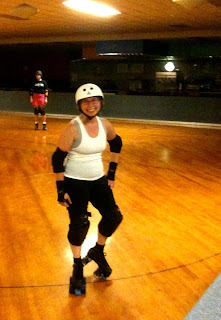 It had been a few weeks since I had been fully integrated in with the other skaters. I had a mouth guard. I had a few done a few hitting and whipping drills with the team. I should mention that during this time, the winter, we were in our off season, so practices were focused less on scrimmaging and more on basic skills derby. Anyway, we were doing a drill where we all skate around the track in a straight line, and the person in the back has to take a whip from each person in front of her. A whip is when one skater holds out their arm and the person coming up from behind grabs it and the first player flings her forward in order to give her a boost of speed. I was halfway up the line, most teammates just giving me pretty mild whips. Then I got to Julietta Vendetta. We were coming up on a turn as she held out her arm and I grabbed it. Long story short, I was sent flying. Obviously V didn't give me the whip with malice, but when I learned the importance of balance in roller derby ... also, from that point on I knew I could no longer expect everyone to take it easy on me. On Saturday, May 1, a group of Hellions had a table at the first outside Troy Waterfront Farmers Market of the summer. The summer season runs from the first weekend in May to the last weekend in October. Were you at the Market on Saturday? Did you see and talk to the Hellions? Hellions at the Market: Sonic Euthanizer, Asa Diamonds, Reading Rambo, Leela Pot Pie, and Pork Slap.